zLFO is advanced digital ultra-low frequency oscillator with a lot of different features. Four CV inputs, 12 base waveforms + filtered noise, phase distortion, syncing, one-shot mode, gated mode, fade in, bit reduction and strobe output. Two software LFO instances with possible internal self-modulation allows to create an incredibly complex waveforms. Power consumption: 35ma @ +12V, 10mA @ -12V. 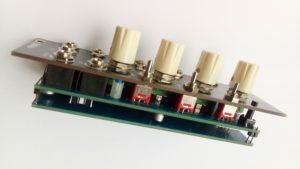 Available as assembled module or PCB+Panel set.